Paul Christensen’s novels, The Hungry Wolves of Van Diemen’s Land  (2014), The Heretic Emperor (2015), and Reveries of the Dreamking  (2016), form the Wolves of Joy trilogy — three novels that take place in the immediate past, the present, and the future in a world shaped by global-scaled factions and conspiracies, yet still containing glimpses of individual idealism and moments of hope. I’ve reviewed the first two here  and here , and I still consider The Hungry Wolves of Van Diemen’s Land to be the number one essential novel for recommending to millennial nationalists (and potential nationalists). Where The Hungry Wolves of Van Diemen’s Land is episodic, joyful and based firmly in a personalized and localized present day/very recent past, The Heretic Emperor is built on struggle for a better joyful future (despite all appearances to the contrary) glimpsed through the long-angled lens of numerous and often disparate international testimonies. Reveries of the Dreamking brings us the next phase of that future . . . but it brings no joy and little hope in its luminous tale of a soldier who is “not great like Scarlotti or like Maddy’s martyred love” but finds himself on a hero quest nonetheless. I had the distinct honor of interviewing Paul Christensen in regards to various aspects of his latest novel, and the last of the much vaunted Wolves of Joy trilogy, Reveries of the Dreamking. I didn’t want to talk about the plot per se to avoid divulging any spoilers (for those hypersensitive to such matters, avoid question 13), but I found quite a few areas to discuss that should whet the appetite of any and all potential readers. JHH: Would it be accurate to say that like Dickens’ third ghost—that of Christmas to Come — Reveries of the Dreamking serves to present us with shades of what could come if the world is allowed to continue as it is going? PC: Reveries has a very dreamlike atmosphere (my wife said it reminded her a bit of a David Lynch film) and a fantastical setting, and while it contains glimpses of a fragmented world under the continued nightmare of globalism, the satirical element isn’t so heavy as with the first two books. Nevertheless, it continues the saga, now projected into a time when Scarlotti is dead, and the Curia have regrouped. JHH: The idea of being played by forces we can scarcely imagine, of being manipulated for the arcane purposes of hidden powers, of not even being able to possess one’s own legs to journey through a sacred quest on, is very much a part of this novel. Is this pointed at mainstream global society in general, or more insidiously, at each and every individual one of us? And, if it is the latter . . . how do we trust anything we encounter? PC: Hidden forces doubtless exist, and some are hostile, but we shouldn’t be overwhelmed by them. We know who to trust by listening to our instincts, by “following the voice of blood” (to paraphrase an old music group called Graveland). JHH: Your characters are motivated by an inner sense that people must be able to have the ability to live life individually or else we are not free. Freedom from being shackled by political correctness, freedom from institutional and meaningless laws and rules, freedom from being treated like puppets — I would consider these essential tenets of National Anarchy. What is your take on the political leanings of your characters? Of your trilogy as a whole? PC: Despite barely featuring as characters, the presence of the Wolves of Joy shapes, defines, and permeates the entire trilogy, hence they give their name to it. They are like a more rebellious version of the old German Wandervogel movement, with maybe some similarities to National-Anarchists as well. Some people will think that Scarlotti (who is in some ways the Wolves’ ally, and in some ways their nemesis) is modelled on Donald Trump. In fact, The Heretic Emperor was drafted before Trump announced his presidential campaign (leaving aside the fact that the two men have little in common personally), but perhaps the novel does bear some responsibility on a magical level for Trump’s conversion to anti-globalism? JHH: Do you think that your own locale has colored your world view in any way? 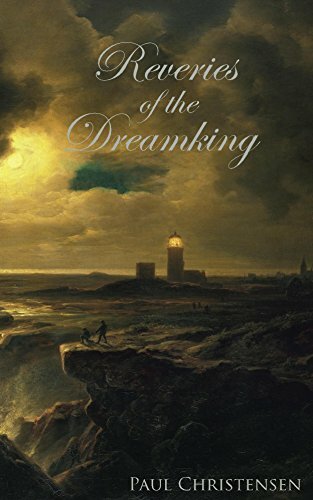 How does it affect the setting of Reveries of the Dreamking? PC: My own locale didn’t influence the setting of Reveries, it emerged (rather fittingly) from a dream. A dream of a large, dirty, and corrupt tropical city, somewhere in Polynesia, and of another island much further to the south, colder and more pristine, where a strange, skeletal creature was kept imprisoned in a pit. From those sketchy beginnings came the story. JHH: I find that there are many levels to your novels — your writings are not solely plot or character driven, but instead are pointedly esoteric. Am I reading too much into them? What are your influences here? Who are your influences? PC: The books certainly have esoteric dimensions, but can also be enjoyed by the casual reader as entertaining and moving stories. I try to write the kind of stories I myself would enjoy to read. I don’t know about influence, but some writers I have gotten a lot out of on various levels would include Miguel Serrano, Knut Hamsun, and Hans Christian Andersen. JHH: This raises the question, then, how much of each Wolves of Joy novel is a test that must be solved for the answer to be revealed? Does this function as a form of initiation into the arcane philosophies contained within the depths of your works — that is, if a reader isn’t ready to face a truth, that truth will remain obscure behind highly meaningful words that also have a lesser meaning? PC: Each reader will hopefully get from them as much as he is capable of. JHH: What would you advise readers who do not yet understand your novels? PC: Let them simmer in your subconscious a while. JHH: All three novels contain a sense of just-written immediacy, in fact that is one of their vital strengths — they contain elements that come straight out of the absurd realities we deal with every day, from baby Varg and Antifa in The Hungry Wolves of Van Diemen’s Land to the reality shows and rock stars of Reveries of the Dreamking. How do you decide just how much of a dose of this poisonous world to inject into your writing? PC: The inclusion of such elements is partly what propels the story, as many a character’s fate hinges on the way he or she reacts to the sterile globalist anti-culture. I myself hate it, of course, as do growing hordes of others. JHH: And, more interesting, how do you keep abreast of such elements while still keeping your head clear enough to write novels such as these? PC: I usually read a bit of world news at breakfast. While enjoying the sardonic humor of sites like Daily Stormer and Info Stormer, I try to take in a variety of sources. When writing, I shut the world out entirely and drink direct from the unconscious. JHH: Your use of the term “curia” is interesting; the dictionary meaning is not quite the same as the meaning in your fictional world. Would you explain a bit why you chose that specific term for what we would call “the established political regime”? PC: The Scarlotti character in The Heretic Emperor is supposed to be a reincarnation of the medieval ruler Friedrich II, who was constantly at loggerheads with the papacy, so that’s why I picked the term Curia, although the enemy Scarlotti is fighting is obviously not the Roman Catholic Church, but rather the modern manifestation of globalism. Thus it is the Unicursal Curia, “unicursal” referring to a kind of labyrinth with only one path. JHH: How did you come up with the history of the invisible Birdking and the Ahu that exist in this novel? How does this work with the title, Reveries of the Dreamking? Who is the Dreamking? PC: The Dreamking and Bird King are the same . . . “Dreamking” is a translation of the original Ahu name, while “Bird King” is what the Mantuaroans call him (also the name of an album by the English neofolk band Fire + Ice). I have often felt that the world is a dream, and that the ultimate explanation for existence is that it arises from a great and infinite Unconscious, which is beyond both Being and Non-Being. But there may be another explanation . . .
JHH: In the first novel, there are a few light hearted moments of what you might just consider “larks” — spontaneous attacks on the system — and in this last one this spirit of joyful rebellion is absent, replaced by not larks but by a Birdking — can you talk about why this happened, in the world of your novels? PC: The third novel is actually the grimmest of the three. I don’t know why this is . . . I didn’t have as much control over the creative process as I did with the other two. Everything is more murky and uncertain, although there is a ray of hope at the end — and the central character learns some deeper truths about the esoteric war. JHH: In this third novel, the Wolves of Joy have not only moved away from their place of origin, but have lost the essential emotion that defined them — leaving them both rootless and grim. Is this a statement of despair and/or is it a warning against losing our core values, our hearts? Do you see this as an inevitable state — that no matter how we try, we will always fail to sustain joy (as in freedom)? Did you consider alternative outcomes for the wandering Wolves of Joy? PC: The Wolves move from their inception at the end of the first novel, to being a vital rebellious movement in the second, to a more settled existence in the third, which proves to be their undoing. A new rebellion arises at the end, unrelated to the Wolves, whose drama is by then played out, and so a new cycle begins. This is both natural and inevitable. JHH: While I understand that these three novels comprise a trilogy, will there be future Wolves of Joy novels that fall outside of this trilogy? What are you working on now? PC: No further Wolves books are planned, but I have started a new novel called Greybeard. It is the story of an aging hippy who, faced with the murder of a loved one in the anarcho-tyranny that is Merkel’s Germany, snaps and goes on a brutal vigilante killing spree, accompanied by the mellow sounds of The Incredible String Band and Tangerine Dream. JHH: How can potential readers find you? PC: A blog has been set up to promote my work, which among other things features a wordcount (and bodycount) update for the new book Greybeard, so people can see how it’s progressing. JHH: Any final thoughts you’d like to add? PC: Thanks for the interview, Juleigh!